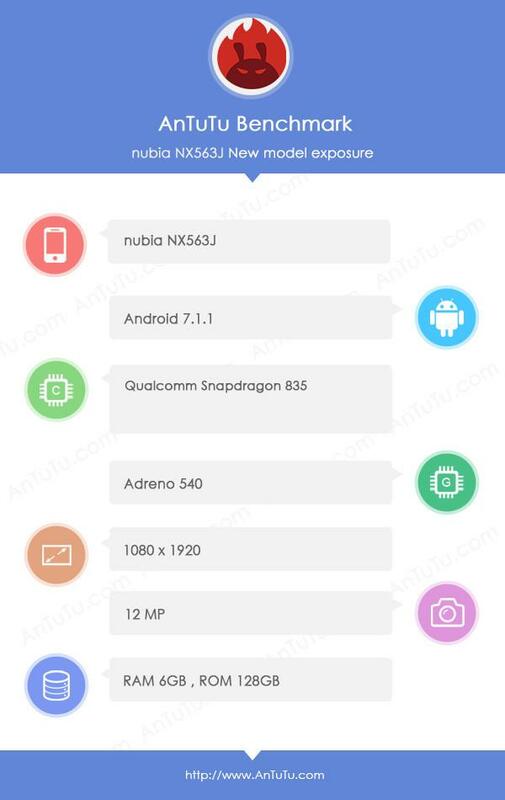 The first time we heard about the upcoming flagship from Nubia was a week back when a mysterious device with the model number NX563J was spotted on Geekbench with Snapdragon 835 processor. Now, when it comes to smartphone leaks via Benchmarking sites, AnTuTu is surely the most trusted one. We have seen that if any device leaks via AnTuTu, the specifications are accurate most of the time. This time, the Nubia Z17 has passed through AnTuTu with the model number NX563J. There was doubt regarding the name of the phone with the model number NX563J, but today, it is confirmed that it’s the Z17. Talking about the spec sheet, the listing reveals that it features a 1080p display which is weird regarding the fact that it is going to be a high-end phone that will compete with Mi6, OnePlus 5, etc. Anyways, the phone is powered by a Snapdragon 835 processor along with Adreno 540GPU. This makes it yet another phone after the Galaxy S8 and Mi6 to be powered by the Snapdragon 835. The device features dual cameras on the back with 23+12MP sensors which make it yet another camera-centric device. It seems like the phone will give a tough competition to the likes of Mi6 and OnePlus 5. What are your views? Do let us know via the comments section.